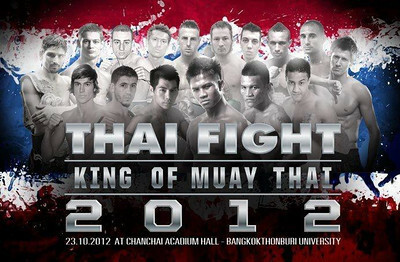 Thai Fight is making a stop in Italy on it’s 2012 international tour. Expected to be participating on the October 23rd card is Buakaw Banchamek, who is now well established feature fighter for Thai Fight. Buakaw recently won a judgement to even fight at all, given his very public dispute with former camp Por Pramuk. The dispute eventually was resolved within the Thai legal system. Thus far, Buakaw has won Thai Fight’s 70kg tournament last year and has two wins under the Thai Fight banner this year. Buakaw won those matches in definitive fashion. The first round of Thai Fight 2012 tournaments will be open on October 23, 2012 at Chanchai Acadium, Bangkokthonburi University. It will be followed by a second round on November 25th 2012 in Nakhon Ratchasima. The finals will be held on December 16,2012 and will be held at the Royal Plaza in Bangkok. The October 23, 2012 event will feature notable Thai nak muay Singmanee Kaewsamrit in the 67 kg division and Buakaw in the 70 kg division. It will be telecast live from 1:20PM onwards on Thai Channel 3. So for sure a stream is going to be available to view for those of you that need little sleep. There will be two tournaments held in two weight categories of 67 kg and 70 kg. The 67 kg weight category will be a 8-man single elimination style tournament and the 70 kg weight category will also be in the standard 8-man tournament format. It’s hard to say the Thailand based Thai Fight promotion hasn’t helped raise the profile of international Muay Thai, obviously it has. But there seems to be a desire or perfunctory requirement to mismatch in regards to Buakaw’s opponents. Though certainly his opponent in Michael Piskitello in France was a very live opponent way back from their 2011 meeting. Certainly, with relatively softer competition Buakaw will invariably shine and mete out a crushing loss to his opponent. Though any fight is never a foregone conclusion, I would like to see Buakaw be better matched. Ultimately, it does Thai Fight and international Muay Thai little good for Buakaw to dole out summary loses to opponents that in my opinion are not of his caliber. In fact it makes it look like to an extent that is what international Muay Thai could come to represent. And in at least my own opinion these uneven matches do little to enhance Buakaw’s legacy in the sport. What should raise more than one eyebrow internationally is that Buakaw will not fight any Thai opponent. Muay Thai Focus revealed the details in a very telling article detailing the statement from Thai Fight’s promotional representative here. Finally, the card does seem to have been gathered into something resembling a final version of what is to come. Here is the card as announced by Thai MuaySiam Club website. I do add the caveat that the card is of course subject to change and revision. ~ by fatsoking on October 15, 2012.